Grit is on the final leg of their return trip to Thule. This morning they are at Waypoint B11 loading up the SAGE traverse equipment on their sleds. The crew stopped Saturday at Benson 1-10 to cut the wire, as requested, on the SAGE weather station. They were not able to get to the station (ID 5) because of deep, soft snow. The traverse has been making impressive mileage the last few days. Their best day yet logged 73 miles in one day. It may be the proximity to civilization or the decreasing elevation, but they are hoping to pull into Thule on Monday afternoon, June 2. Unfortunately, they are now running into falling and blowing snow causing whiteout conditions and some of the deepest fresh snow the crew has ever seen on the ice cap. They are reporting snow billowing off the front of the tractors like a bow wave on a boat. They’re also reporting that the spreader bar is sinking below the surface of the snow. These conditions are likely to slow them down as they will need to double haul sleds through this snow. The Demobilization crew has continued preparing the transition and warehouses for the arrival of all the equipment. This work has been wrapping up and the crew has started doing light vehicle maintenance. They’re also cleaning up the DRMO trucks for science use later this summer. It’s been a tremendous trip for the GrIT crew. Earlier last week they arrived at NEEM, where they parked the sled and tractor that will winter over for use next year to relocate the camp to a site called NEGIS. The crew also photo documented the camp facilities and sleds, and burrowed into an underground storage trench to take measurements for JP. 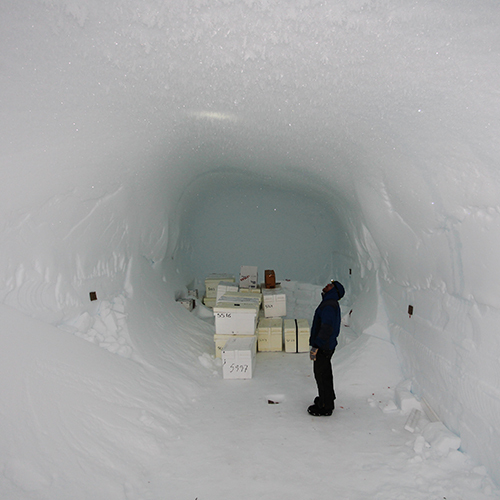 It was an impressive underground storage space made entirely from snow.